This podcast series is devoted to sharing good teaching practice at Gardens Elementary School which is located on the King Abdullah University of Science and Technology campus in Saudi Arabia. At GES, our student population is multi-cultural, diverse, enthusiastic, engaging and confident. They are also fun loving and happy. Through the IB Primary Years Programme (PYP) we provide opportunities for students to develop an understanding of essential concepts, skills, knowledge and attitudes that will enable them to be lifelong learners. Our students are actively involved in authentic inquiry-based learning across all the curriculum areas. They develop confidence in their abilities, think for themselves, question, express their opinions and respect the opinions of others. As students learn to reflect on their learning, they become critical thinkers. We encourage students to voice their ideas and to take action to improve the school and the community. Student achievement and progress is shared through regular assemblies, parent conferences, open houses and activities aimed at making the school a stimulating center for the community. In this episode, Siobhan discusses what Responsive Classroom is and how she is using different elements of this approach with her grade 4 students in order to strengthen the relationships she has with students. By using specific strategies related to Responsive Classroom, Siobhan has seen the impact it has on building trust amongst her students and better connecting them with one another. Not a day goes by when Siobhan does not use Responsive Classroom routines and approaches which is important in embedding this experience into the culture of the classroom. Listen to this episode to learn specific things you can do to immediately apply Responsive Classroom strategies with your students. Siobhan spent her formative years growing up in Ghana and attended the Valco School in Tema for Grades K-5 before returning to the U.S. This may explain why, once she became a teacher, she chose to teach internationally. Siobhan has 25 years’ experience teaching grades 1-4 in Sudan, Pakistan, China, England, Bangladesh, Nigeria, and India. She joined the KAUST School in August of 2017. Siobhan is passionate about developing a strong sense of community within her class and the school. 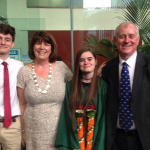 Siobhan enjoys traveling and exploring with her husband, Mike and two children Hayley, who attends Lynn University in Fla. and Matt, who is a 10th Grader at The Kaust School.